To really live in Idaho is to hike its beautiful trails. But this requires one key essential — the walking stick. No, not one of those cookie-cut, commercial sticks that anyone can pick up at an outdoor store, you need a wood staff created by God and handcrafted in Idaho (not attached with the sticker – “made in China”). Let me give you seven reasons for why you need an Idaho walking stick. Stability – If you are traversing a mountain slope, the stick provides you some leverage. If you slightly trip on a tree root in the trail, the stick helps you catch yourself. And if you are walking along the top of a fallen tree log, the stick enables better balance. Support – Nine mountains in Idaho majestically rise about 12,000 feet in elevation. The Nine 12ers test the knees, especially when you hike down. It can be a bone jangling experience; but a walking stick minimizes the impact on the joints. Also, a stick helps when you are carrying a heavy backpack. Not only do you have support, but your hand holding the stick will not swell because it is more elevated. Security – The stick can push back the thorns or thistles when you are bushwhacking. It can move to the side a slithering snake or keep distance between you and an unwanted, small critter. Sight – What happens when you can’t see the depth of that murky stream? Go ahead and probe it with your stick. Likewise do you wonder if that particular rock is solid to step on? Find out by prodding it with your stick. Let your stick discover the information for you. Strength – Sometimes you just need a friend to lean upon. Don’t hang on your backpacking friend, that is what your stick is for. The Idaho walking stick provides rest for the weary. Survival – It is easy to custom design your stick to have a compass embedded on the top, and survival string, hook, and caribiner wrapped on the side, etc. Find some bait and go fishing. Live off the land. Style – Most importantly, an Idaho walking stick gives you style. And do consider marking your sticks with classy notches, symbols, brands, or pins to note the various trails that you hike. Retain the memories on your stick. 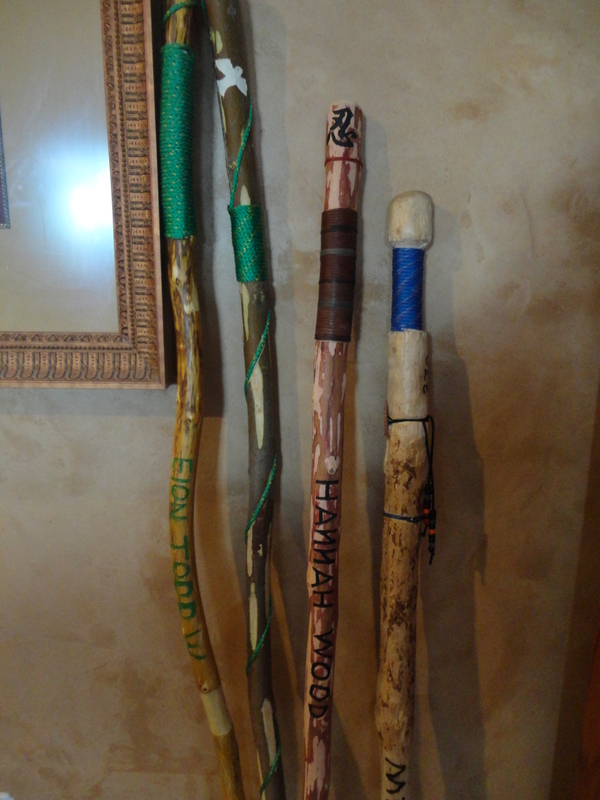 If you would like a handcrafted walking stick from Idaho Falls, contact my youngest son, Micaiah Todd Wood. He will custom design the stick to your preferences. The walking stick is the standard for Trail Life USA. This entry was posted in Uncategorized and tagged backpacking, camping, hiking, Idaho, walking sticks. Bookmark the permalink.